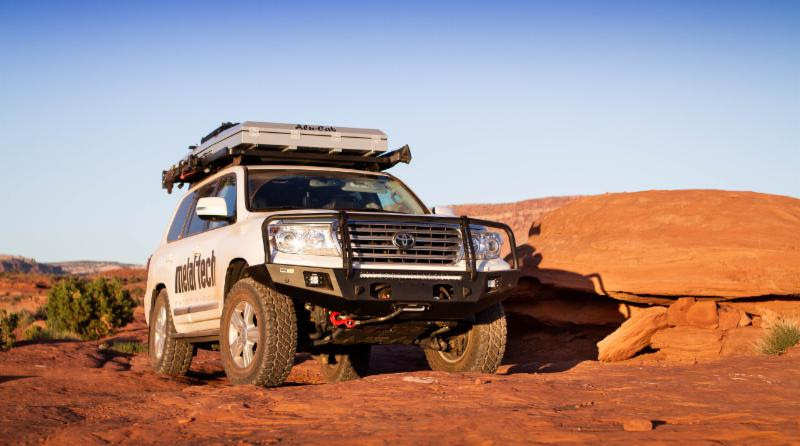 The Ghost Rider front bumper for the 200 Series Toyota Land Cruiser is the first full bull bar designed, engineered, and hand built in the USA. It provides excellent approach angle and critical head light protection giving you confidence while out in the back country. From the driver’s position you are able to just see the outermost corners of the hoop giving you confidence on where the outer edge of the bumper is for tight trails. The bumper is a two part design with our winch mounting system independent of the bumper shell for an easy installation. The winch mount is installed first, then the winch can be installed and wired without having to lift an entire bumper with a winch mounted to it. The bumper shell then attaches to the winch mount allowing for a custom fit to your vehicle body. We include provision for up to a 12,000lb winch with access for the clutch and solenoid. Integrated 3/4″ recovery points are mechanically interlocked through the shell and tied to the winch mount inline with the frame for confident rigging. The hoop is made from mandrel bent DOM-SRA tubing providing full surround front end protection for the hood and headlights. There are laser cut openings for LED flange mount fog lights, (included with stage 2), and for a 30″ single row LED spot/flood combo light bar, (included with stage 3). On the outer edges of the hoop are welded tabs providing mounting location for limb risers or antennas. The outer ends of the bumper shell next to the fender have tabs to secure your fender liner preventing it from bending back into your tires. We value the factory safety and convenience systems from Toyota and have designed the Ghost Rider to work with these systems maintaining stock functionality. We provide laser cut holes for the front parking sensors to mount. The center hoop of the bumper does not obstruct the Dynamic Radar Cruise Control or the forward facing camera. The bumper also allows you to keep your head light sprayers in their factory location. Metal-Tech 4×4 designs and builds high quality off-road products for Toyota 4×4’s using state of the art 3D scanning and CAD tools. In addition, Metal-Tech 4×4 specializes in high performance suspension systems for most Toyota 4×4’s. Based in Newberg Oregon, Metal-Tech 4×4 distributes across the US and internationally in over 40 different countries. Metal-Tech 4×4 started out in the founding owner’s garage in 1999. Officially formed as an LLC in 2000, Metal-Tech Cage, LLC started by designing and building roll cages for FJ40 Toyota Land Cruisers. Modern day Metal-tech 4×4 employs 9 full time staff members across design and development, production, technical support and customer service. “Protection Evolved” continues to be not just our slogan but our way of thinking and innovating how we build and design the high performance off road products we craft.